Cool, thanks! Looking forward to trying it out. Started on this now... will post an update when I'm done. Done. I haven't really tested it. Let me know if something doesn't work right. I did create a third person project and all shaders built ok. So it should be good to go. Hi there. Many thanks for doing this! Just finished building and tried with daz models from 4.19 mod project. At first glance everything works! I will test some more and report if I find anything. I merged into 4.20.1 and things seem to be working after some basic tests. Thanks! It would be really nice if Epic would incorporate this into the core version as an option. Either that, or if DAZ's next generation would use linear skinning...they have so many JCMs already, would it really be that much of a difference? Why can't Daz Studio+Epic work together for making the workflow between Daz Studio and Unreal Engine easier. Or why can't Daz add more bones/weights to the chars instead of doing some strange magic, that only works in Daz Studio. It would have immense potential to have realistically bending characters in a game for the first time! Can someone update the link plz or supply the older link? nvm I found out I had to accept the invite sent to my email to bypass the 404. Hey, how can I apply this for 4.17, because there's no branch for that version in the repository. Still Error 404 despite github account. What invitation? You can try cherrypicking the 4.16-mod revision for DQ if you know git. If that doesn't work, you could try 4.18-mod instead. @dizzy88: I doubt Epic would add this to main branch. They took out DQ from UE3. Maybe I'll ask one of the maintainers. You never know. I'm a noob at this. I followed the Github installation and built and F5'd to run it in Visual Studios. It seems to be running 4.13 of unreal. I actually deleted the folder because I thought I might have downloaded the wrong one. Can you please tell me how I run it with 4.20? Thanks Frank, I got it working. Do you have to set any special settings to get DQ working once you import a character or should it be working right off the bat? It works right away, but you have to open the right .exe (modified UE Editor .exe). What many people don't know: It's a global modification, that works with every Character and not only with DAZ-Chars. Awesome work, @AlienRenders , thank you a lot! Will DQ build of UE 4.20 be performant enough for that purpose? If not, then maybe it would be great to have an option to turn off the DQ skinning selectively for meshes to revert to classic UE4 skinning, or even better - to toggle DQ / classic skinning based on some parameter linkable to LOD (distance etc.). It shows that your changes where committed on 12 Nov 2017 and that the fork of the 20 branch is 16261 commits behind EpicGames:release, but at the same time it shows that the latest changes in the branch are just 2 months old. 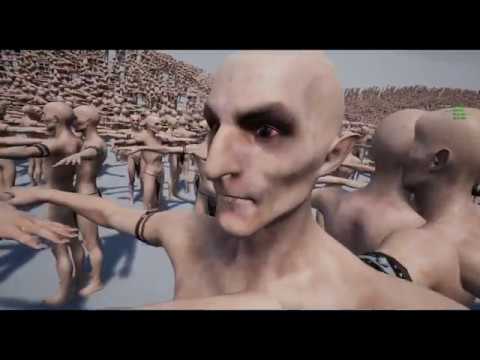 Maybe slightly off-topic question but still - what animations / animation packs are the most compatible with DAZ Genesis 3 skeletons in UE4? Does DQ skinning look better only on DAZ animations or does it noticeably improve also animations mapped from other sources (UE4 mannequin etc.)? I wouldn't want to go through Mixamo, because, well, most probably Mixamo animations would loose all the reason for DQ skinned animations. And also not sure how to make Genesis3 characters fully compatible with Unreal IK system on Genesis 3 characters for correct feet placement when stepping on stairs and for picking up items, using sockets etc.? It's a shame that there are still no good in-depth professional tutorials about this topic. The Verum Bit video I mentioned seems to be the most complete but even that misses some important aspects to call it full character development for UE4 based on Genesis 3 models. While playing around with animations, poses etc. I've encountered situations, where I needed to scale some bones, for example for simulating swelling of certain body parts or for an even broader range of facial expressions, but it doesn't work with the Dual Qaternion Version of Unreal Engine. In blender everything looks fine with "preserve volume" checked, but in Unreal Engine there are bad artifacts, if I use scaling. Will there be a version of the Dual Quaternion Mod, which allows for scaling of bones? Great work! the 4.20-mod works perfectly. will combine with JCMs per maya script plugin should be very interesting results in Unreal. Hello, working on installing the 4.19-mod and noticed that it installs 4.19.1. My question is how can I update the install to 4.19.2 using github or another git editor? without losing the DQS support? I'm still learning github so please let me know in an easy to follow way. Please get back to me. Thank you. Scaling should work. I tested it myself. If it doesn't work, then something else is going on. What version are you using? @JustAMartin I haven't tested performance. It's likely slower because of some of the conversions necessary. If it weren't for the linear blending code already there, I could optimize it to be the the same speed or even faster (this is by looking at the shader code only). But no, I haven't been able to load up a scene with enough characters to see a difference. Vertex shaders don't tend to be the main bottleneck in a 3D engine. DQS only works on models meant for DQS like G3 and G8. It won't look correct for other models. I've used Mixamo with G3 and G8. It worked fine at the time, but they removed the automatic rigging. So I don't know that it's worth it anymore. As to sockets and foot placement, I worked a very long time on my own solution. It's not specific to DQS. In fact, it's completely unrelated. You can use UE4 animations with G3 and G8 figures. You just have to build a rig to handle the conversion. There are tutorials on how to do this. When done correctly, you can use UE4 animations no problem for example. They work splendidly. I use them myself. You can create a rig for Mixamo animations as well. These also work great. The UE4 conversion works wonders. But it has to be set up correctly and that part isn't easy. There are lots of videos on youtube to help you out though. I'm not putting an option to selectively turn on/off DQS per mesh. It doesn't work that way. I suppose someone could do that. But it would be a tremendous amount of work. It is a compile time option and it is global. So you can turn off DQS if you want to revert to the original UE4 build. It has to be a compile time option because of the way data is sent to the shader and there is only one code path for that right now. Otherwise, we would need another option per mesh, have separate data structures and it would just slow everything down. As to the commit dates, the ones you listed are the original dates from way back on other branches. The merge was done on August 4, 2018. If you want a more recent version of UE4, just do a merge. If there is demand for it, I can update it myself if need be. Not really related to the DQ, but maybe someone knows: is there a way (or a mod) to make clothing and morphs work together in UE? It was possible in the past it seems (before 4.12), but then they removed it. With clothes from daz only simple things unaffected by morphs can work if you use physics simulation, like here I made the end of the tie moving, but if i try to enable nvcloth on the skirt it will be wrong. @AlienRenders, maybe you have an idea? annaputrino: I haven't had time to really look at UE4 lately. I've been busy with other stuff. I looked at your link. Seems like a really bad decision. I never really liked APEX from what little I saw. The code is scary. I'm afraid I just don't know enough about it and what changes were made. @AlienRenders, they said somewhere they removed it because there was some performance problems but they will re-make it in the future. 4.21-mod with DQ is up. TIFF is also there, but it's disabled. If you want TIFF support, modify the Engine/Source/Editor/UnrealEd/UnrealEd.Build.cs and Engine/Source/Runtime/ImageWrapper/ImageWrapper.Build.cs files so that you uncomment the section relating to TIFF and comment out the line below it. You'll need to run the batch file in the libtiff thirdparty folder as well to build the tiff library. Compiles without problem, thank you very much! Is there somethining new related to skinning in 4.21 or it's the same as before?